People write letters to writers, and sometimes the mail is a gift. Not long ago, Bill Martin wrote to tell me that he’d read a poem of mine that begins with an image of purple loosestrife growing between the stones in the Merrimack riverbed. 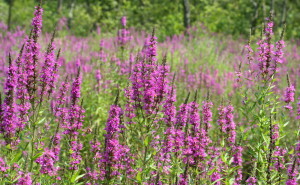 He described the genesis of purple loosestrife in the valley, the flashy plant that runs wild every summer. 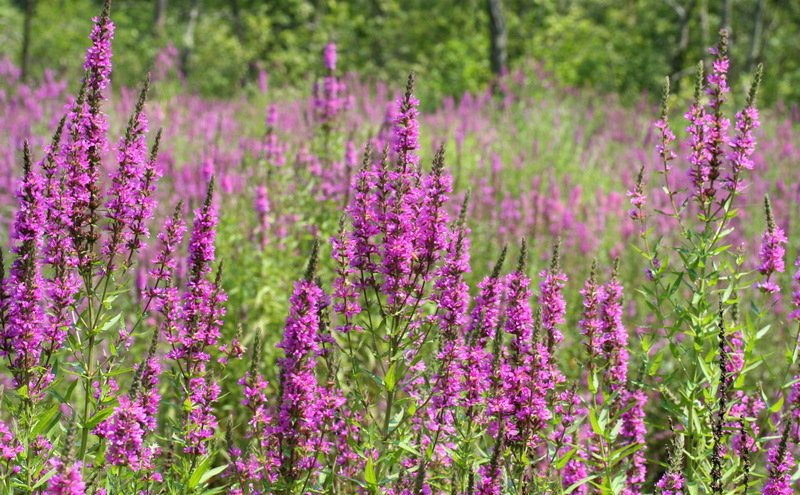 A beekeeper who worked in a local mill learned that bees were drawn to purple loosestrife. “When a large shipment of wool bales came from Australia, he knew it would contain loosestrife seeds,” Bill explained, “Australia being the only place on earth that grew this wonderful plant. He swept the floors after the bales were opened and washed, took home bags of dirt and seeds from the floor, and piled it around his hives. That year, plenty of loosestrife grew, and he sold the seed around the world through a beekeeping magazine, becoming quite famous in those circles.” The farm was in Chelmsford, near the cloverleaf of routes 495 and 3. That’s not the only story of the origin of the loud purple flowers. Historians say the seeds were embedded in wool shipped from England to Lowell’s textile mills. Long purples, as they are known there, grow in the English countryside. Shakespeare mentions the wildflower in one of his plays. A writer in the Merrimack Valley says her mother calls the plant “millweed” and seconds the Australian wool story. My oldest brother swears he was told the seeds had come east on the wings of airplanes flying across country from California during World War II. The Latin words for the plant are Lythrum salicaria. Loosestrife itself is a translation of lysimachia, a genus of plants named for Lusimakhos, the Greek doctor credited with its discovery. The plant was used as a tranquilizer for animals and a nerve tonic for people—a remedy for stress. North American field guides call it an “alien plant” or an “imported European.” The sturdiest type thrives in southern Canada, the American Midwest, and throughout the Northeast. Local naturalists despise the invasive loosestrife for the way it crowds out native species. When a friend of mine from Los Angeles visited Lowell in deep summer, she praised the strange, prolific plant. Seeing the rocky bed of the river streaked purple, she said the city should put loosestrife on its official seal. Some folks consider loosestrife a weed, not purple tuning forks vibrating with the memories of no-school seasons. I know a teacher who says the ugly color signals the end of vacation. The flowers rise in July, just before native corn hits the stands. Patches decorate side roads. Purple veins trace a brook into the woods. Like dog-day torches of summer, loosestrife ignites the ditches and flares across fields of wild grass and brush. I almost expect to hear the sirens of fire engines rushing to extinguish the blazing color. The mill that beekeeper worked in was the same mill in which my father worked as a wood grader for most of his life. The mill was a hot, stinking place in July. When I was eighteen, I tended machines in the basement for two days before quitting. My father brought home colorful foreign stamps torn from sample bags of wool shipped to the mill. Another man found the seeds of purple loosestrife.